9258 ND FRENCH COLONIES (1937) Colonial Arts Exhibition. 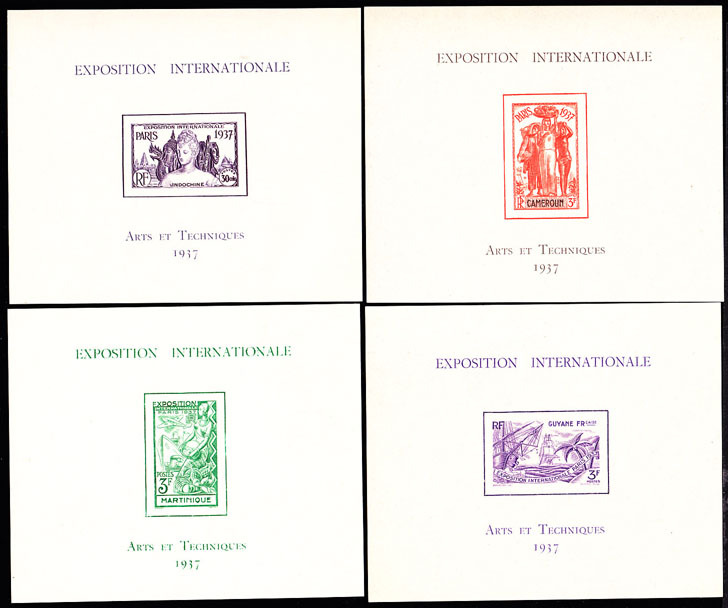 Collection of 24 imperforate souvenir sheets issued for various French colonies (Cameroun, Dahomey, French Equatorial Africa, French Guyana, Guinea, French India, French Polynesia, Soudan, Guadeloupe, Indochina, Inini, Ivory Coast, Kouang-Tcheou, Madagascar, Martinique, Mauritania, New Caledonia, Niger, Reunion, St. Pierre & Miquelon, Senegal, Somali Coast, Togo, Wallis & Futuna). Some gum toning present.